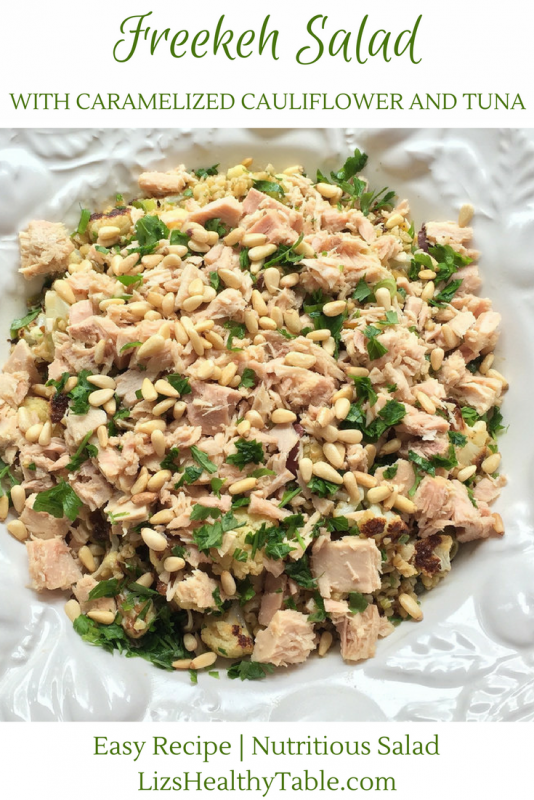 This Freekeh Salad with Caramelized Cauliflower and Tuna is surprisingly simple, and its bright and flavorful flavors make it an ideal addition to any family’s weeknight dinner rotation. 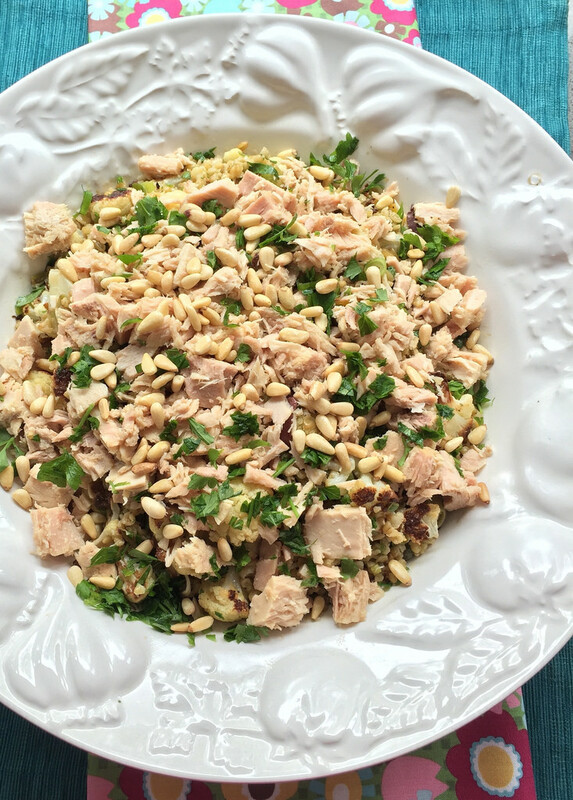 If cooking freekeh, millet, farro, bulgur, quinoa, or other ancient grains sounds difficult or too time consuming, then you’ll definitely want to try your hand at this recipe, created by Maria Speck, author of Simply Ancient Grains. In her book, Maria provides a primer on preparing these nourishing whole grains and turning them into mouth-watering (and I mean it!) breakfasts, lunches, dinners, and desserts for your family. 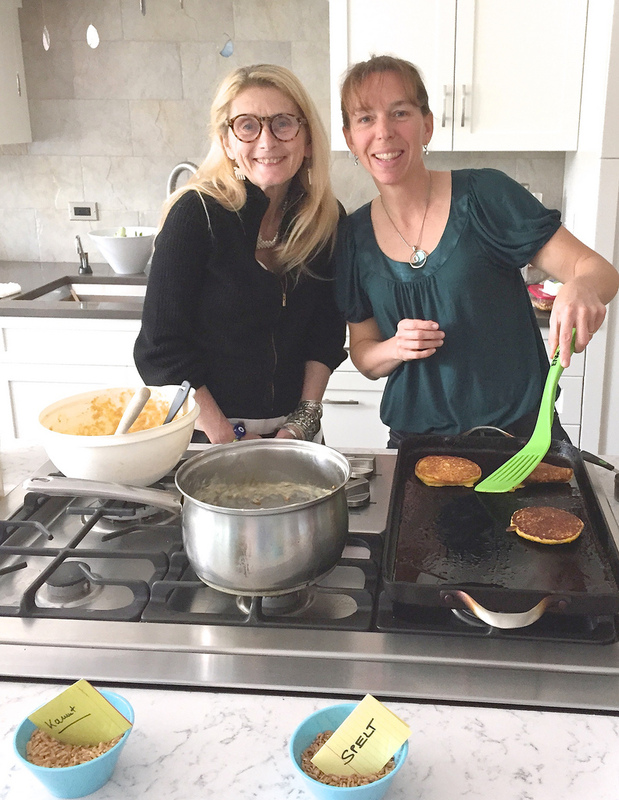 Last week, fellow dietitian, Janice Bissex and I hosted a potluck lunch to celebrate the release of Simply Ancient Grains. Maria was the star guest, and a group of fellow foodies and nutrition bloggers from Oldways and Juggling with Julia joined the fun. Cooking with friends; trying new recipes; learning new techniques. What more could two foodie dietitians ask for?! 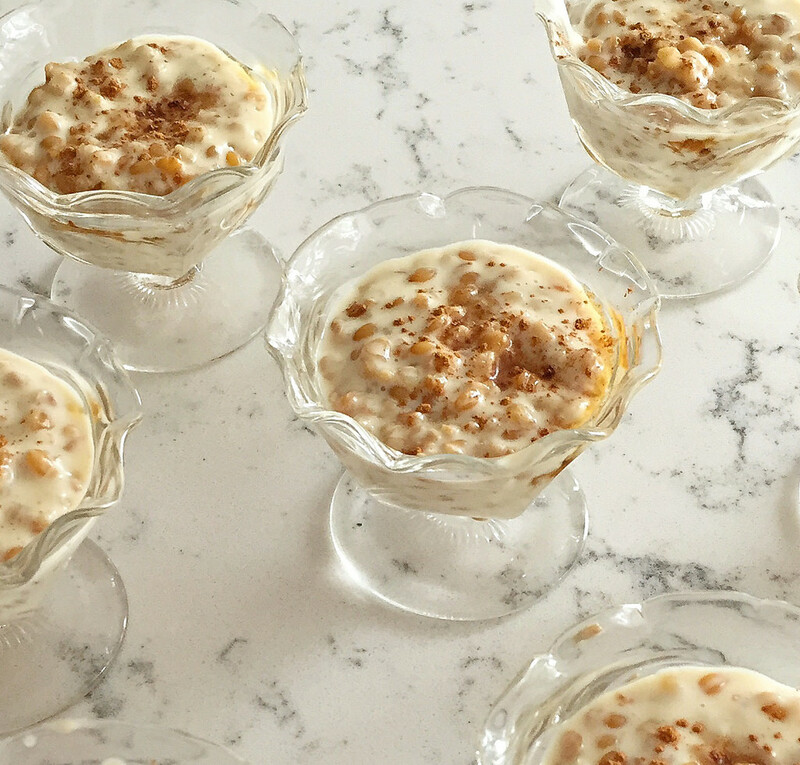 Maria prepared her recipe for Simple Maple Pudding with Farro Piccolo while everyone else chose a recipe from the book and brought it along for the lunch. Freekeh is a Middle Eastern wheat grain that's harvested early in its green stage. It has a chewy texture and a rich, smoky flavor. Reprinted with permission from Simply Ancient Grains by Maria Speck, copyright (c) 2015. To prepare the freekeh, add the broth, water, freekeh, and peppercorns to a heavy 2-quart saucepan and bring to a boil. Decrease the heat to maintain a simmer, cover, and cook until the freekeh is tender with a bit of chewiness, 18 to 20 minutes. Drain, return the grains to the pot, cover, and allow to steam for 5 minutes. Transfer to a large serving bowl and spread to cool. Meanwhile, to make the salad, add the cauliflower florets to a large rimmed baking sheet and drizzle with 2 tablespoons of the olive oil. Season with ½ teaspoon of the salt and ¼ teaspoon of the pepper and toss to coat well with your hands. Roast for 12 minutes, then add the chopped green onions (white and light green parts) and turn with a spatula. Continue roasting until the cauliflower is soft (the tip of a knife should slide in easily) and the green onions start to caramelize, 11 to 15 minutes more. While the vegetables are roasting, prepare the dressing: add the lemon juice, the remaining 3 tablespoons olive oil, the mustard, zest, and the remaining ¼ teaspoon salt and ¼ teaspoon pepper to a small lidded jar and shake vigorously until emulsified. To finish, add the roasted vegetables, the reserved green onion tops, the olives, and capers to the bowl with the freekeh. Set aside 2 tablespoons of the chopped parsley for garnish and add the remaining parsley to the bowl. Drizzle with the dressing and toss to combine. Season with salt and pepper to taste. If you have time, allow to sit for 10 minutes for flavors to mingle. Top the salad with the tuna and garnish with the remaining parsley. Serve, passing more lemon juice around. 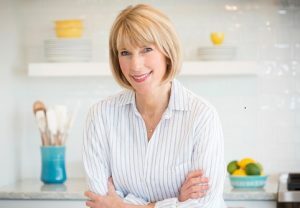 In the cookbook, each recipe comes complete with "fine points," which outline cooking tips and substitution suggestions. For example, with this recipe, Maria says that if you can't find freekeh at the market, use 3 cups of cooked medium-coarse bulgur instead. 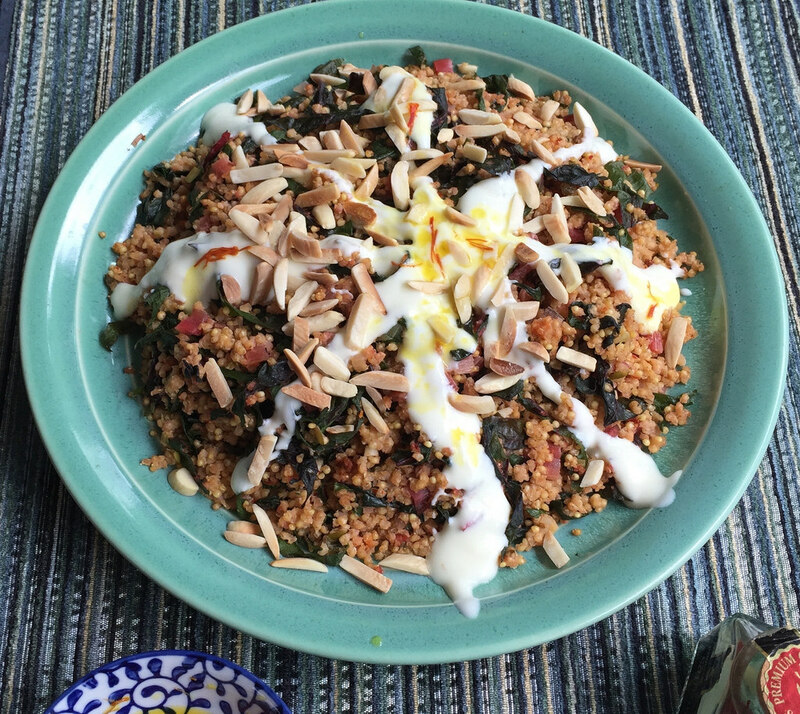 Sara from Oldways brought this recipe for Bulgur with Chard and Saffron-Infused Yogurt, but she used millet instead, making this recipe gluten free. 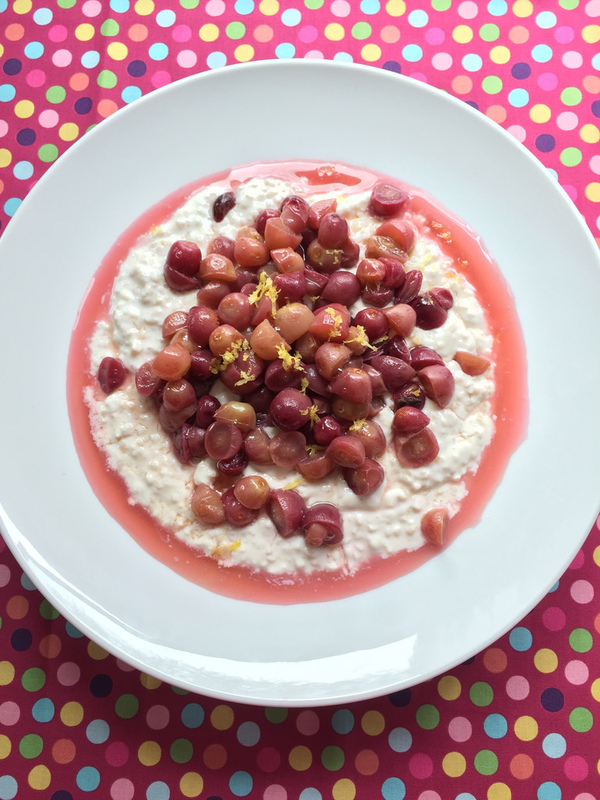 Rachel Greenstein, Communications Manager from Oldways, made this GORGEOUS dessert recipe for Lemony Millet Pudding with Caramelized Grapes. She used bulgur instead of millet and the results were still spectacular. We loved every bite! 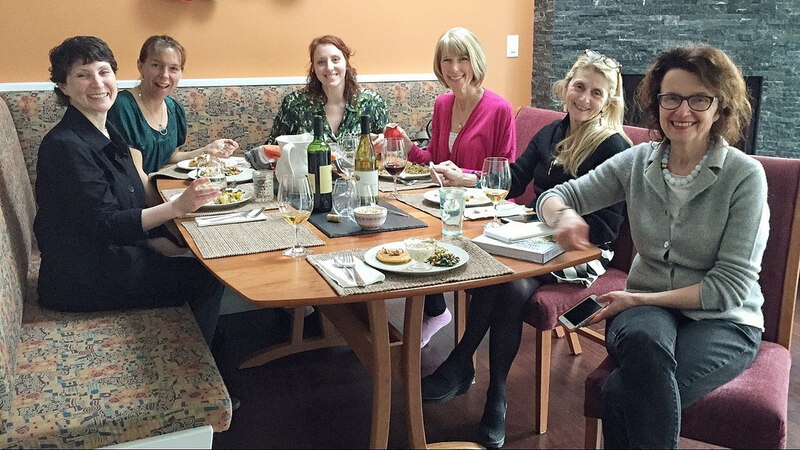 Here are a few more photos from our #SimplyAncientGrains potluck lunch. Sara playing with food photography. Maria imparting her kitchen wisdom! I would love to have a copy of Simple Anicent Grains. I love learning about food, my husband loves eating my food. In the past few years, every time I make a new type of grain, I tell my husband about it. He could really care less about it. But recently, whenever I mention we are having bulgar or farro, he adds “That’s a whole grain!”. I think my job is done! I have always been afraid of cooking with grains so I haven’t. After listening to this episode I think I should give it a try! I would love the book to help me start this new adventure. Gotta get my hands on that book! And what a fun lunch. Looks like such a fun lunch and a great book! 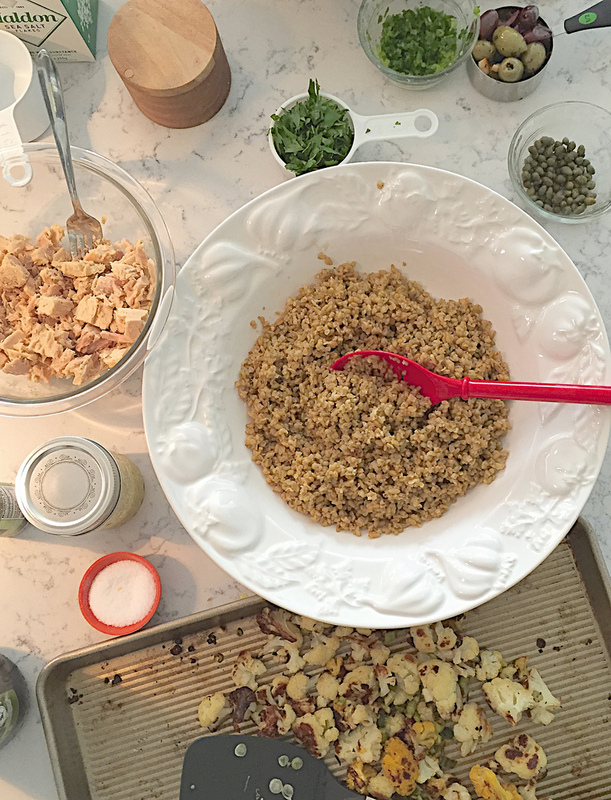 I love trying different grains, and recently experimented with freekeh. Great to have another recipe to make with it! 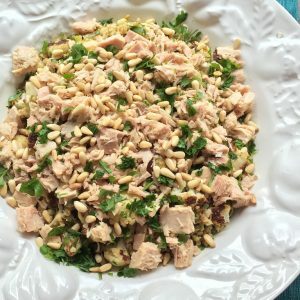 I’ll admit I’m a little timid when it comes to cooking different grains, but after seeing this recipe and reading more about freekeh I think I should give it a try! Just listened to this podcast during my run this morning. 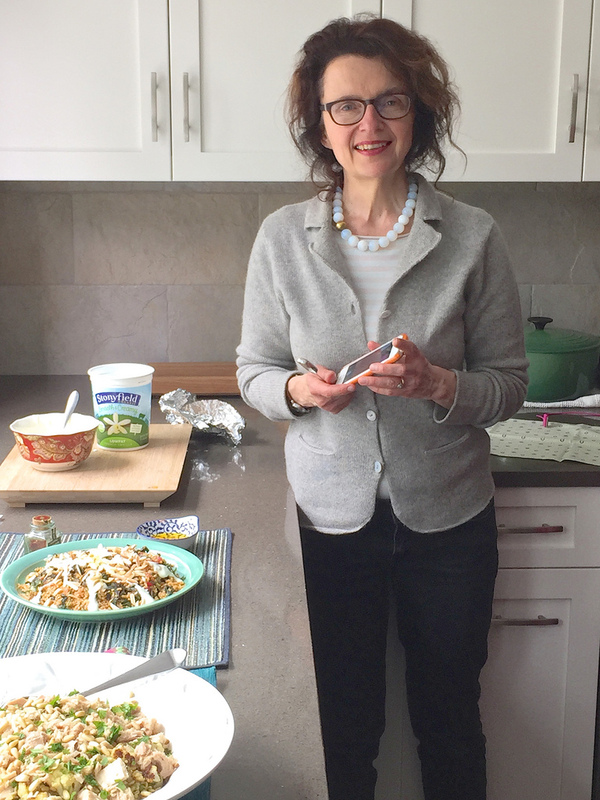 I love that Maria focuses on helping the average cook make her recipes to their likely with the tips she provides. Sounds like an amazing cookbook. Definitely hope I win it but otherwise will need to purchase it! I’m hooked on ancient grains for bread baking but don’t know what else to do with them. I NEED this book!! I’d love to win because I’m trying to expand my grains in meals I cook. I just tried making amaranth porridge, and it was a complete bust 🙁 So looking for more ideas! 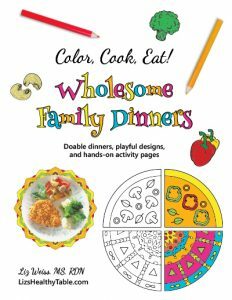 I would love to win a copy of this cookbook! 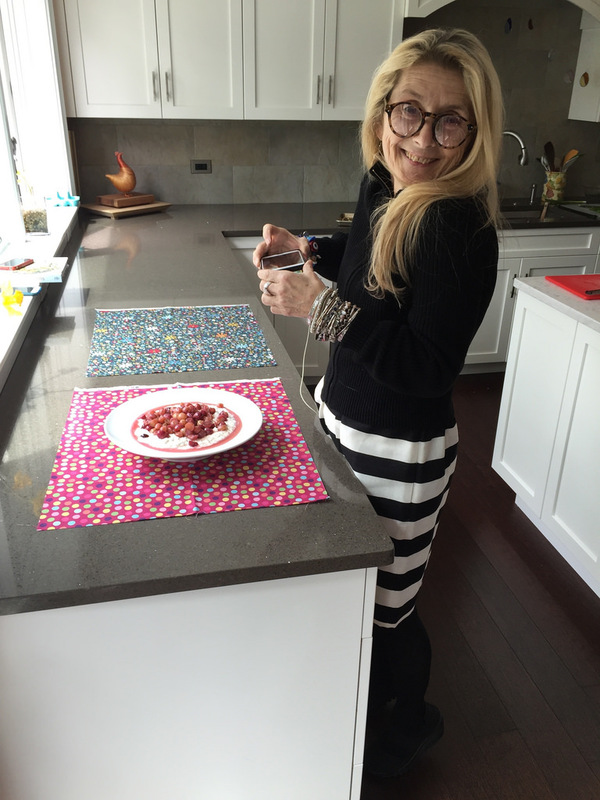 I loved listening to maria and want to incorporate ancient grains into my families diet. The only ancient grain I’ve used is quinoa. 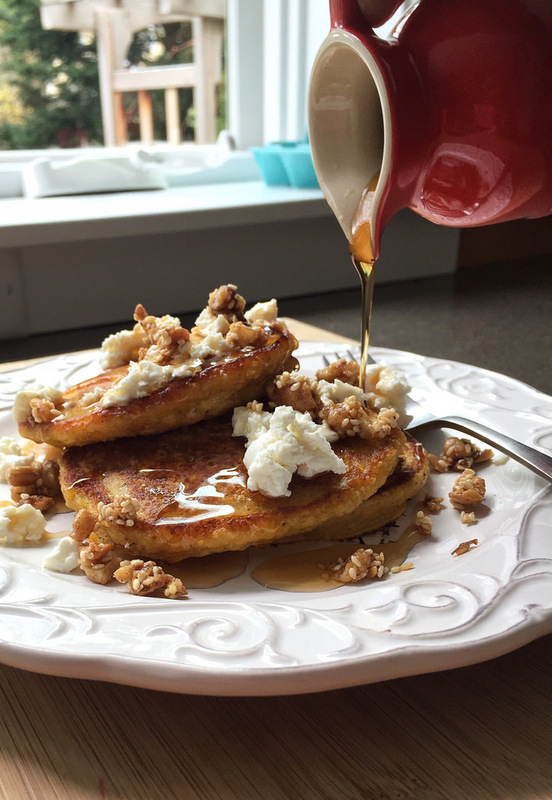 I like to cook up a big batch once a weeks for breakfast, I warm a serving, add maple syrup and plain Greek yogurt. I love it, and it is as quick as cold cereal and milk. I hear so much about eating ancient grains but do not know how to cook them so I would love to get a cookbook with great recipes for these grains. I have a garden and am experimenting with what comes out of it. 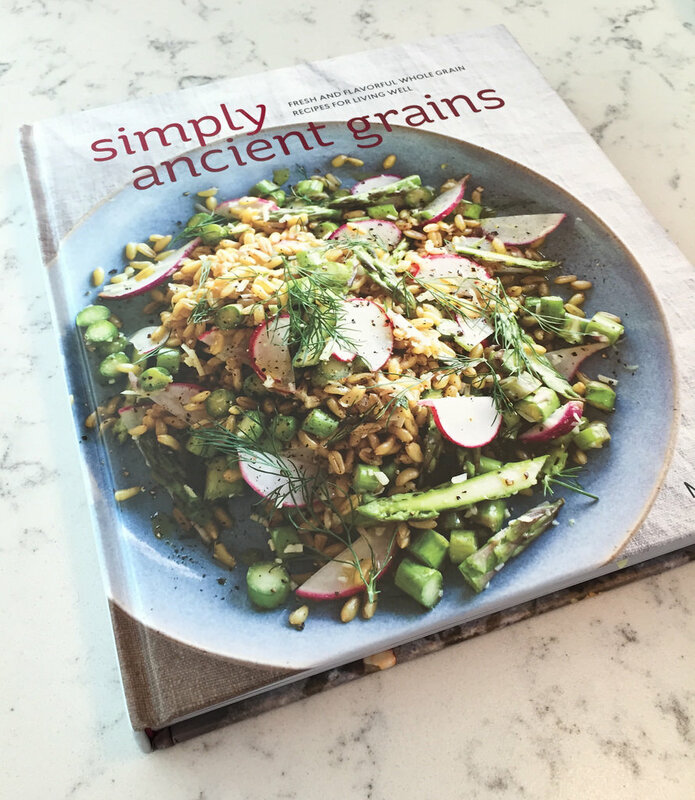 I would love to try some ancient grains to go with the meals I prepare. I would love to make some of these recipes! My favorite ancient grain recipe right now is from Cooking Light magazine – Farro with Honey-Garlic Roasted Tomatoes. Don’t forget to add the feta on top. We’re so happy you found us. 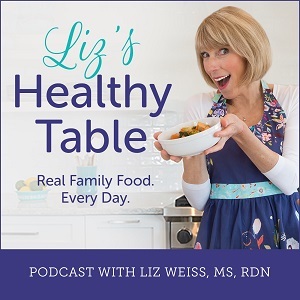 I think you’ll enjoy this show very much as well as Episode #256 on Whole Grains and Gluten. Let us know when you’ve had a chance to tune in … we’d love to hear what you think! Thanks Bev. I would love to win so I can get some healthy recipes! I love cooking grains and trying new grains! Rice is the only grain I cook with. After listening to the podcast, I’m excited to introduce the other grains into my diet. Kelley, let us know what you try first! I follow you on pinterest and Facebook. I love grains, but have fallen away from using most of them because my youngest has Prader-Willi Syndrome. Her functioning seems to be much higher with higher fats/proteins. I’m interested learning more about how ancient grains can fit into this food dynamic for our family overall. And the recipes look delicious!! I’ve been a follower on FB… love the ideas! I am a registered dietitian and proud mom of two busy boys in new orleans. I am always trying something new when i get time to play in the kitchen. I share it all with my mom network (and clients and friends)!!! I dont have time to reinvent the wheel- who does??? Oh, I keep looking at grains and wondering how to add them into my family’s meals. This book is full of possibilities. 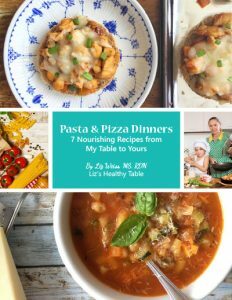 Would love to try some of the creative and healthy recipes! I have been hearing about ancient grains more and more recently. They are still unfamiliar territory for me but I would love to start to incorporate them into our diet. 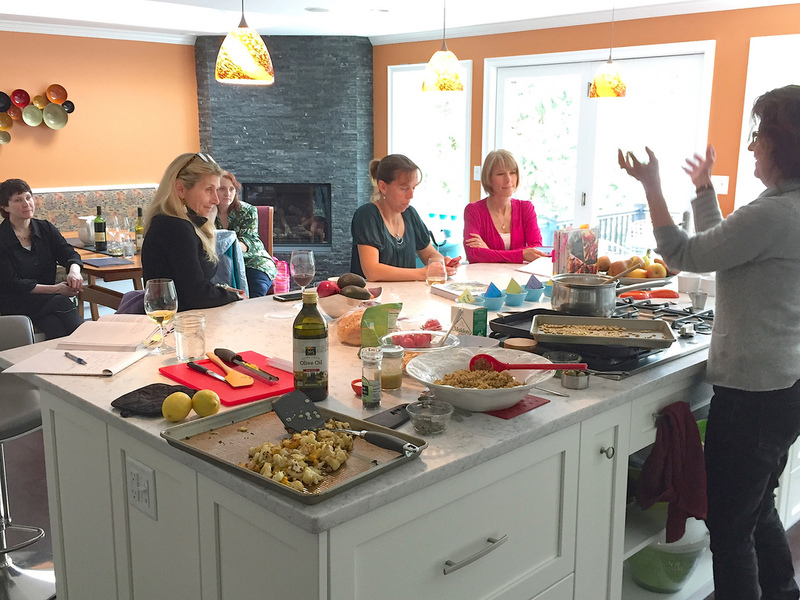 Thanks for sharing the recipes with us and helping to introduce me to some new ideas. Frizelle with tomatoes, olive oil and salt. I don’t know a whole lot about the grains. I would love to get this book and be able to learn a little more. This would be fabulous! I met Maria in Boston before the new book. She is amazing! I would love her new book! I’d love to win this book! I used to think I was really up on ancient grains because I like farro and could say quinoa properly before anyone else could! But I’ve fallen behind and need to learn about more of them. As a vegetarian family we love grains and would love this book! What a great podcast. I am excited to try more grains now–my family’s diet needs some better hearty, meatless meals. I’ve known this for a while, but haven’t found the right inspiration until now. I would be super excited to win a copy of this book to get me started. P.S. I love the bowl “sculpture” hanging on the wall in your kitchen. I have the same one hanging in my own kitchen. Does it get much better than amazing meals with wholesome grains? Healthy, fresh ideas! Bring it on! I am loving on farro right now! It’s great in salads and side dishes, or for a main meal. And of course, quinoa is a go-to around here. I haven’t done much yet with spelt or freekeh, but look forward to giving them a try! Especially this recipe with cauliflower and tuna – sounds like a great combo!